The Nice-Saint Augustin-Airport multimodal hub will be the Eco-Vallée’s main transport hub. Situated on the East-West axis, close to the airport and to the Arénas district, the Nice-Saint Augustin-Airport multimodal transport hub will ultimately include a train station (trains and high speed trains to Paris, Marseille or Italy), a bus station for urban and interurban bus lines, a direct link to the city via the tramway, bicycle stations (Vélo bleu) and electric vehicles (Auto bleue), relay parking areas… . This 90 000 m2 infrastructure represents a pilot operation within the EcoCité approach, and plays a key role as well within the Grand Arénas operation, providing an exceptional access to this new business district. The transport hub will be directly connected to the international airport and to the future multimodal stations within the Eco-Vallée. 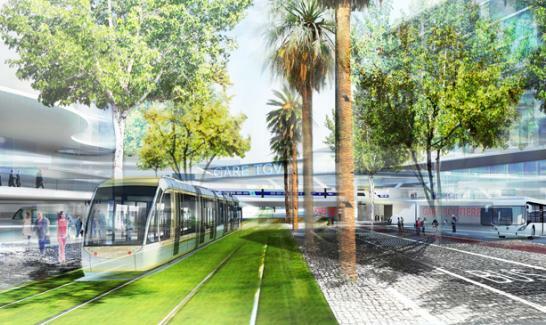 Other multimodal stations are planned in the Var valley: the first will be in Lingostière and another one is scheduled within the project of the eco-district of Saint Martin du Var. 1150 places of parkings-relais and TGV.